Cladophora, a nuisance, native green alga that grows attached to solid substrate in all of the Laurentian Great Lakes, has recently expanded in extent, partially due to the activities of invasive quagga and zebra mussels. During significant storm events, it detaches and is transported toward shore, where it fouls water intakes and washes up on lakeshore beaches, causing outbreaks of avian botulism as it decays. Our research question has been, "Can Cladophora extent be mapped using satellites for monitoring of this problem?" 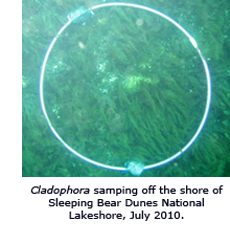 A depth-invariant algorithm developed at MTRI was first used successfully with satellite imagery to map Cladophora and other submerged aquatic vegetation (SAV) on the bottom of the Sleeping Bear Dunes National Lakeshore in Lake Michigan under NASA funding. Under a GLRI grant, we have recently mapped the near-shore extent of SAV for Lakes Michigan, Huron, Erie and Ontario (Cladophora is not yet a significant issue in colder Lake Superior). MTRI generated the Satellite-Derived Great Lakes SAV Maps above under Great Lakes Restoration Initiative (GLRI) funding (award no. GL-00E00561-0). 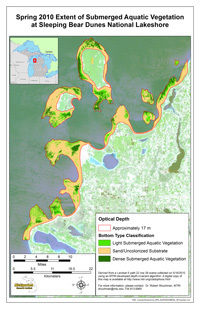 These maps represent the extent of SAV in the optically shallow areas of Lake Michigan (areas where there is a return of light from the bottom). 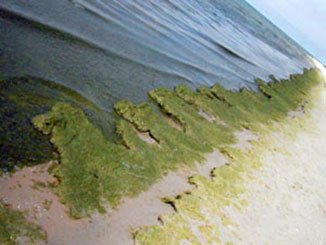 The SAV in the Great Lakes is predominantly Cladophora, with localized areas of vascular plants, other filamentous algae, and diatoms. The maps, which have a 30 meter resolution, were generated using an MTRI-developed depth-invariant algorithm and utilized Landsat satellite data from 2008-2011 collected during the vegetative growing season. The total area of optically shallow water mapped across the lower Great Lakes Basin is approximately 10,080 square kilometers, of which 2,360 square kilometers or 23% is mapped as SAV. The total dry weight biomass of the SAV present in the lower four Great Lakes is estimated at a conservative weight of 129,000 metric tonnes based on an average dry weight of 50 g/m2 and a model-based estimate that 90% of the total biomass is visible. SAV extent has been successfully mapped in the nearshore using Landsat 5 and 7 imagery in addition to commercial satellite imagery. Landsat satellites offer a near-nadir, consistent viewing geometry that is helpful for SAV mapping. The historical archive offered by Landsat is longer than that of any commercial satellite, allowing for long-term time series analysis of Cladophora growth. Continued support from existing and future Landsat missions is essential for this and other Great Lakes research programs. The extent of SAV is fairly stable from one year to the next. 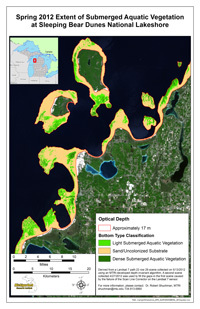 To support this, the distribution of SAV at Sleeping Bear Dunes National Lakeshore was mapped in 2010 using imagery from the Landsat 5 satellite and again in 2012 using Landsat 7 imagery to assess the short-term change in SAV extent. In both years, the mean optical depth was just over 17 m and approximately a third of the visible lake bottom was classified as SAV (34% and 33% in May 2010 and May 2012, respectively). Some classification differences occurred between the two maps due to the combined influence of atmospheric effects, changes in water quality, differences between the Landsat 5 and 7 sensors, and differences in weather patterns in the two years. Project results will be made available on the MichiganView and GLOS websites as they are finalized. Watch researchers on YouTube explain the Cladophora research being done at MTRI. (Above) Cladophora washed up the shore of North Manitou Island, June 2010. Research is funded by EPA's Great Lakes Restoration Initiative (GLRI) and NASA. Research contributors are scientists and engineers at Michigan Technological University and the University of Michigan. Shuchman, R.A., Sayers, M.J. and Brooks, C.N., 2013. Mapping and monitoring the extent of submerged aquatic vegetation in the Laurentian Great Lakes with multi-scale satellite remote sensing. Journal of Great Lakes Research, 39, pp.78-89. Brooks, C., Grimm, A., Shuchman, R., Sayers, M. and Jessee, N., 2015. 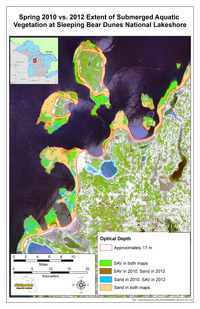 A satellite-based multi-temporal assessment of the extent of nuisance Cladophora and related submerged aquatic vegetation for the Laurentian Great Lakes. Remote Sensing of Environment, 157, pp.58-71. Bootsma, H.A., Rowe, M.D., Brooks, C.N. and Vanderploeg, H.A., 2015. Commentary: The need for model development related to Cladophora and nutrient management in Lake Michigan. Journal of Great Lakes Research, 41, pp.7-15. Kuczynski, A., Auer, M.T., Brooks, C.N. and Grimm, A.G., 2016. The Cladophora resurgence in Lake Ontario: characterization and implications for management. Canadian journal of fisheries and aquatic sciences, 73(6), pp.999-1013. The c. 2010 Cladophora/SAV extent data displayed on the mapping page at https://geodjango.mtri.org/static/sav/ is available for download at ftp://ftp.mtri.org/pub/SAV_Cladophora/. Please credit the Shuchman et al. 2013 and Brooks et al. 2015 citations above when publishing about uses of the data.